Treat yourself to an exotic parenthesis, far from the urban tumult, with a view of Mont-Blanc. Our team is at your service to make your holidays a dream holiday where you can combine relaxation in our spa, skiing on the slopes in winter, hiking in breathtaking landscapes in summer and leisure activities in the village. This typical Savoie chalet, with wooden cladding and balconies facing Mont-Blanc, benefits from absolute peace and quiet in the heights above Megève. After a ramble, a visit to one of the quaint Savoie villages nearby or a day skiing at the Evasion Mont-Blanc estate, there is nothing like a relaxing time in the fitness centre, where there are sauna, jacuzzi and steam room. If you are looking for entertainment, the free shuttle will take you into the centre of Megève for a carriage ride or a delicious hot chocolate on a café terrace. Les Chalets du Prariand, built by the eminent architect Henry Jacques, at the origin of Chalet Mégevan proudly stands on the heights of the most chic resort of Savoy. At the foot of Mont-Blanc, the spirit of the mountain reigns here. Loan of cot and availability of microwave oven, blender, high chairs, booster seats and baby food (upon request). Day or half-day guided hikes and excursions in partnership with the Megève Guides Company. Animals admitted in the rental residence: 8€/night/animal and at the hotel an extra charge of 14€/night/animal. Like most of the typical Savoie Chalets in Megève, the most fashionable resort in Savoie, the Chalets du Prariand were built by the eminent architect Henry Jacques. They fit perfectly into the background of Megève, completely in accord with surrounding nature, dominated by Mont-Blanc. The two forms of accommodation, hotel or holiday let, offered at the Chalets du Prariand allow you to choose what suits your family best. You may consider that freedom on holidays is full board at the hotel, others may prefer a comfortable apartment. At Vacances Bleues choose whichever freedom you prefer! The chalet has 52 non-smoking rooms (for one to four people) 39 of them with a view of Mont-Blanc. This establishment does not have facilities and premises adapted to people with reduced mobility but our team is sensitized and able to listen to you for any particular requests. The establishment has designed 16 apartments that can be rented to 4–5 people. The Megève holiday rental package enables you to enjoy a family holiday in complete freedom at your own pace. Benefit from a comfortable holiday let, designed for stays with children. You can also benefit from certain additional services the hotel has to offer. Animals admitted in the rental residence: 8€/night/animal and at the hotel 14€/night/animal (to be reported at the time of registration). € 77 per apartment (to be paid on the spot). The three-star hotel in Megève promises you holidays with delicious food, attentive service and a welcoming atmosphere. The “Les Trois Marmottes “ restaurant generally offers continental dishes, not forgetting the delicious local foods of Haute-Savoie! During your hotel stay in Megève, choose between half-board and full board. For customers renting holiday lets, you can book a restaurant meal and buy takeaway food (with a supplement). Revamped bar open from 8.00 a.m. to 11.00 p.m. Delicious light après-ski meal with crêpes and hot drinks (with a supplement). Regardless of the season, the Haute Savoie offers visitors a variety of activities to be enjoyed in a family or as a couple. The mountains, in summer and winter, offers a wide variety of activities, combining excitement and discovering nature. Benefit from your stay in Megève to discover the region, the local dishes, the wealth of its cultural heritage and the many leisure activities available to all. Games area, outdoor tennis, football pitch and volleyball court, games room with table football and table tennis. Trekking and guided excursions, during the day or half-day in partnership with the company of Megève guides. Every winter, discover our one week snowshoe outings, in January and March. INCLUDED in your stay of one week: in partnership with the Compagnie des Guides de Megève, 3 half-day hikes, supervised by a professional. half-day hikes are offered from the hotel, depending on the snow conditions. Adult all levels. No extra charge, material included. The Evasion Mont-Blanc ski area: 220 alpine ski runs over 445 km, 3 snowboarding areas and 95 lifts on Megève, La Giettaz, St-Gervais, les Contamines... Equipped with snow cannons, the ski area offers snowy slopes all season long. For lovers of Grand Skiing: the Vallée Blanche, one of the most famous off-piste or Les Grands Montets from Chamonix for the world's biggest ascents! Preferential prices on ski and equipment hire from our partners. Free connection service between the hotel and the resort centre. Free connections of Megève buses at the foot of the slopes. Visit the Domaine de Coulairon, its reindeer herding, its sheepfold and take a snack under a yurt. The countryside around Megève offers you a number of delightful beauty spots to enjoy in summer so that you can appreciate the mountains and valleys of the Haute Savoie. Megève also offers you, during the summer season, a host of outdoor activities to be enjoyed by the whole family, a variety that will offer something for everyone! Dog-sledding: with family or friends, you can enjoy total relaxation and getting away from it all in the company of Alaskan malamutes. Hot air ballooning, aviation, paragliding to explore the Haute Savoie and its magnificent peaks. Thrills are guaranteed. Mountain-biking: pleasant excursions through Alpine meadows and the foothills of the Alps. Excursions along the steep paths that hug the mountainside, rambles in forests or wild hikes along the peaks, there are plenty of mountain-bike trails near Megève. Furthermore, there are two cable cars and a cableway that will take you to mountain-biking trails so that you can fully enjoy your activities and guarantee plenty of thrills. Golf: Eighteen-hole Mont d'Arbois golf course + practice greens and club house for beginners or seasoned golfers. Horse-riding: an equestrian centre offers horse-riding lessons, trekking and riding lessons on ponies or horses. This will delight the children as well as the grown-ups! Rides for a morning or for the whole day. Summer sledding: two 500-metre courses with a gradient of 100 metres. For sledding and tobogganing enthusiasts, this is an ideal site for summer. Paragliding: from the top of the Rochebrune cable car run, you will get the chance to paraglide and experience new thrills. Tree-walking:fifty or so different activities at 6 to 11 metres above the ground. A special trail has been created for children aged 5 to 10 ten years old is available for the little ones. And lots more activities await you during your stay in the mountains of Haute-Savoie: rafting, canyoning, rock climbing, a via ferrata, parachuting, bungee-jumping and more. A childcare centre from 3 to 12 years old is available during the school holidays of Christmas / New Year (from 23/12/17 to 08/01/18) and winter (from 10/02/18 to 12/03/18). In summer, activities for children from 6 to 10 years old are supervised by an animator during the French school holidays. Entertainment and activities during the summer school holidays. 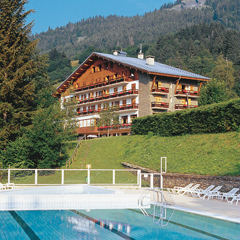 In the heart of the Haute Savoie, facing Mont-Blanc, the three-star hotel, Les Chalets du Prariand, is 1.5 km from the centre of the Megève resort, half an hour from Alberville du Beaufortain, 45 min. from Chamonix and one hour from Annecy and Geneva. Chamonix: The Mer de Glace glacier, the Aiguille du Midi and its Alpine museum. Snow-shoe hikes are offered several times a week. Les Chalets du Prariand also offers the possibility of hang-gliding. Alpine skiing, snowboarding or cross-country skiing: the Domaine Evasion Mont-Blanc [Mont-Blanc recreation area] covers Megève and various areas. Free shuttle to the town centre and free links to the ski slopes. The village of Megève: The snow-covered village, pedestrian streets, carriage rides, Christmas decorations and more. The Aiguille du Midi at Chamonix-Mont-Blanc: this site high in the mountains offers you a unique 360° view of Mont-Blanc as well as the entire mountain range. The typical village of Megève: its narrow alleys, its little squares, its old stone bridges, its fountains, its unique Chemin du Calvaire [Way of the Calvary], with chapels along the way that retrace Christ’s Passion. The medieval city of Conflans: this medieval city perches on the summit of a rocky escarpment (412m), and has an exceptional lookout post, dominating the valley and especially the confluence of the rivers Isère and Arly. Mountain bike: 2 gondola lifts and 1 cable car to access the paths. Many fun, aquatic and sporting activities at the new Megève Sports Centre. Golf Mont d' Arbois 18 holes and practice. August: The Estivales de Megève, for lovers of classical music, the blues festival. And for a holiday in Savoy, stop at Villa Marlioz in Aix-les-Bains or discover our new club in the resort of Serre Chevalier in the Alps. City tax: rate set per person and per night, to be settled on the spot, liable to be reviewed during the year according to municipal regulations. HALF-BOARD PACKAGE: Half board accommodation (breakfast and dinner), adult entertainment, access to the hotel's sports facilities, parking. Options: Full board: between 36 and 126€/week depending on the period - 6-day escape package: 187,50€ /-15 years - 234,50€ /adult, Pets admitted: 14€/night. RENTAL PACKAGE: The accommodation, bed linen, towels and household linen, maintenance kit, adult entertainment at the times indicated, access to the sports facilities of the hotel. Options: End of stay cleaning: 77€/apartment - Animals: 8€/night - Comfort formula: beds made on arrival, end of stay cleaning, change of the towels on request. Double room occupied by one person: supplement between 36 and 196€/week depending on the period.